Riding the full force GMO backlash of 2014, communities and individuals alike are breaking down the door with Black-Friday urgency in search of better access to better food. Yet in a country where we continue to be limited by the bottom line of big corporate influences and their overarching monetary reach, the first sprouts of a mighty paradigm shift have been peeking through the dirt waiting for everyone to notice. What I’m talking about is the decentralization of food back to communities and individuals. In recent interviews Dr. Richard Alan Miller, herbalist and longtime fixture in alternative agriculture, has described what he sees as proof of a shift in consciousness that is occurring in his recent work on the outskirts of Mexico City, as well as in Chattanooga, Tennessee. 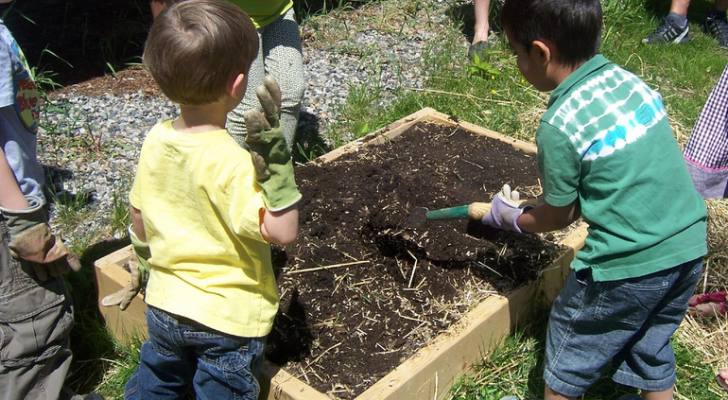 Groups of children, varying in age, are learning to grow vegetables and salad greens on their own terms. Taking a page from Rudolf Steiner’s Waldorf educational philosophy, the children become both the teachers and the students. They learn at their own pace while Dr. Miller and others remain to oversee and provide only minimal, gentle guidance. According to Dr. Miller, while observing the youth interacting with nature he noticed that many of them “had inherent, natural skill that was better than most master gardeners.” The food grown by the children was then used in nearby cities to feed hungry adults. “We are witnessing an educational shift with a new paradigm shift in agricultural reform in which small groups of children grow food for larger groups of adults,” said Dr. Miller. The answer to many of society’s problems can be found by walking in the opposite direction of the current push for further centralization being sold in many aspects of our life. Indeed, it is because of the centralization of the food system that we are now vulnerable to supply chain disruptions that can come from a variety of sources, instantly crippling unprepared communities. In addition, a centralized food supply allows large corporations to monopolize the food sources while diminishing both our rights and the quality of our food. However, alternatives to this model have begun appearing, such as the seven acre Beacon Hill site in Seattle, which made headlines in 2009 with plans for the first free open Food Forest within city limits. Simultaneously, the common sense concept gained momentum through many cities across America. This movement can be seen in the first crop of documentaries chronicling the rise of urban farming and community food forests. America is witnessing many communities develop local foodsheds in small cities and large metropolises alike. A foodshed encompasses the land where the agricultural products are grown or raised, the route the food travels, the markets in which it is sold, and finally the individuals who eat it. This is true community empowerment on multiple levels. With these local movements beginning to establish powerful roots, we are now seeing a supercharged quickening of their efficacy with the use of alternative agriculture practices such as permaculture, biodynamic practices, vertical and rooftop gardens for space limitations, drip irrigation and structured water systems for water conservation, and microbial, phyto, and bioremediation for accelerated soil building. The combination is propelling humanity forward and rebuilding the connection we have lost between our relationship with food and each other. Put into the public consciousness by Michael Tellinger, the idea of the Ubuntu movement can be summed up in one word; contributionism. A straightforward concept, it is set around building community, following one’s passions, and stepping away from the monetary/corporate system. The open-sourced, free food movements happening in every community on large and small scales are testaments to the permeation of this idea and its unstoppable growth. The fact remains that corporations have little power to do anything in the wake of decentralized community contributionism around a free food movement. Just recently, McDonald’s attempted to get its brand into this new paradigm by launching the “Give lovin’, get lovin’” campaign. On McDonald’s heels, Braintree also recently rolled out the #AcceptAnything food truck with a similar “take anything as payment” effort to keep some semblance of monetary control over a system that is in flux and searching for solutions. However, what corporations fail to understand is that this shift is not simply a new market, a changing demographic, or a product to exploit for the purpose of enhancing their bottom line. In many ways, it is because of their corporate abuse, suicidal banking practices, and an overall inability to show empathy that communities are walking away from that old paradigm. In America there are over 46,000,000 people on The Supplemental Nutrition Assistance Program (SNAP) –AKA food stamps. This is proof that the old paradigm didn’t work and is at an end. As individuals and communities learn and empower themselves through decentralized free food urban gardens, it is an absolute certainty that this number will decrease.